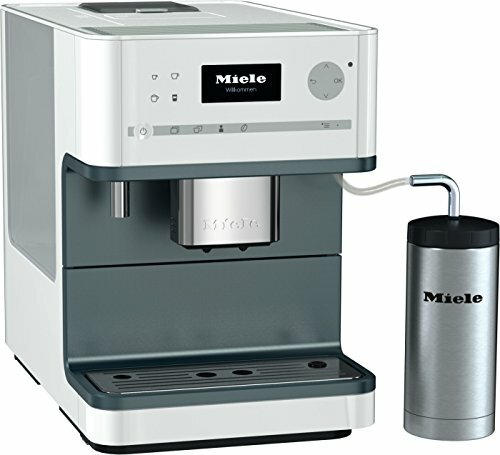 Purchase Miele CM6310 – White Coffee Machine, White at Discounted Prices ✓ FREE DELIVERY possible on eligible purchases. Enjoy the pleasure of first-class coffee in a noble design. The CM6310 sets new standards in user convenience for countertop coffee systems. With a single touch of one of the four main symbols, you can create your favorite coffee specialties right in your own home. With the available selection of four user profiles, tailor your coffee to your own personal enjoyment. Waste no time with the OneTouch for Two function, for two drinks at once or double-portions. Contains ten portion sizes- single and double servings of espresso, coffee, cappuccino, latte macchiato and cafe latte. Additional features include a heated cup rest and dedicated hot water spout. Allow your coffee experience to be simple, fast and extremely delicious.